In the winter quite often the body suffers from lack of vitamins. In order to solve this problem, you can do at home on the windowsill, a small garden. There you can cultivate any spicy greens, which are rich in vitamins, not only in the winter. The vegetable garden is at the most minimal cost can provide you with fresh greens all year. So, to begin with parsley. It is an indispensable ingredient in many dishes. To grow parsley on the windowsill in several ways. The most common of them is the planting of seeds and the distillation of roots. 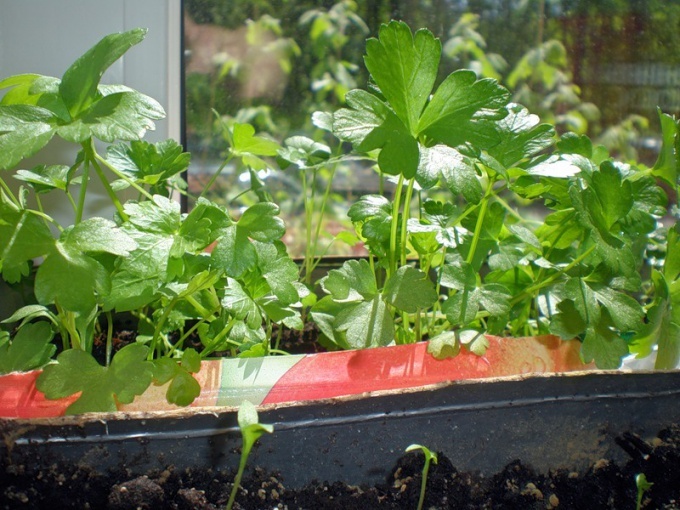 There is one secret that helps to grow parsley on the windowsill from seed. Seeds germinate quickly when seeding keep them for about an hour under running warm water. Then they are soaked for another day. Deepen the seeds of only 0.5 cm, and the top cover layer of soil, not exceeding 1 centimeter. Before sprouting capacity with seedlings should be in a dark place. Water through the day. After sprouts appear, move the receptacle on the window sill where there is a constant good lighting. Seedlings need to be thinned. Between them should be 4 inches. The result can already be seen after 6 weeks. If you use "patch" for a long time, then be sure to take care of the fertilizer. For this purpose, any floral blend. Quite a popular pastime at this time is to grow parsley on the windowsill. This popularity was mainly because of low cost and great efficiency. The greens, especially in winter, brings the human body a big favor. The fact that there are quite a few vitamins that one needs in the winter and not only. How to grow parsley Parsley is a valuable aromatic plant, common throughout Russia. Parsley on the windowsill of the Small roots of parsley can be planted in pots or small boxes of the house in November and in winter to kick out fresh greens at home. It is better to use varieties of root parsley, as its roots are less susceptible to diseases, easier stored and make it possible to obtain the first green. To quickly to grow parsley from seed you need to know a little trick – the essential oil of the seeds do not allow them to ascend quickly, so before planting it is advisable to take it about half an hour under running warm water (wrapped in several layers of cheesecloth and then soak for a day. Try, You must succeed, and soon you will be able to add fresh greens to any dish at any time from the comfort of home, but your window sills decorated with delicious green bushes.